The Sign of the Cross on the Early Medieval Axes: A Symbol of Power, Magic or Religion? Introduction: The tradition of adorning of weapons goes back into the distant past. In the early Middle Ages people also tried to make their weapons look impressive. Among numerous motifs used to decorate swords, spears, spurs and others military accessories, a special position is held by the sign of the cross. The main aim of this paper is the analysis of a group of early medieval axes marked with this sign and discovered in the territory of Europe. Then, it would be explained why this holy symbol was put on such a murderous weapon as the axe. Among several dozens of ornamented early medieval axes, the group decorated with the signs of the cross is not very impressive. The general number of all the artefacts which are known to the author does not surpass 30 specimens. The geographical distribution of this kind of axes is very wide, but, what is interesting, the majority of finds are located all around the Baltic Sea and in the neighbouring territories. Additionally, most of them were discovered in Scandinavia (Denmark – 3, Sweden – 7 and Norway – 2), a few axes were found in Poland (4), Finland (2) and Latvia (2), and only single specimens come from Estonia and Germany. Finds from the territory of Russia (3), however, group along the basin of the River Volga, on the route from Scandinavia to Volga Bulgaria. An isolated find comes from Bulgaria, but in scholarship it is connected with Northern Europe and the Viking culture as well. In comparison to the total number of early medieval axes found in the territory of Europe, the artefacts marked with the sign of the cross are very rare. It is clearly visible for example in Poland, where over 900 battle-axes and axes are known from the period of the 6th–the first half of the 13th century, but only 27 specimens were ornamented. Among these artefacts only four were marked with the sign of the cross. 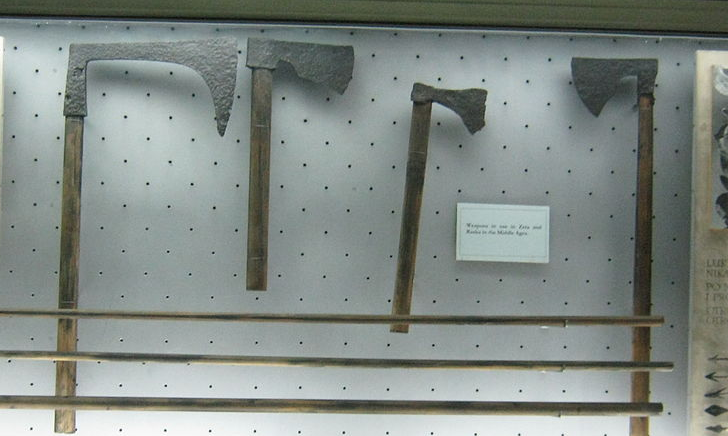 It is only 0.45% of all the axes discovered in Poland.